In this post we’ll be talking about how to install a dual beam HID conversion kit in your headlights. In order to do this you need to use a dual beam relay harness. To begin, let’s start by explaining the difference between single beam and dual beam stock or OEM halogen/incandescent headlight bulbs. Now, let’s talk about HID bulbs. 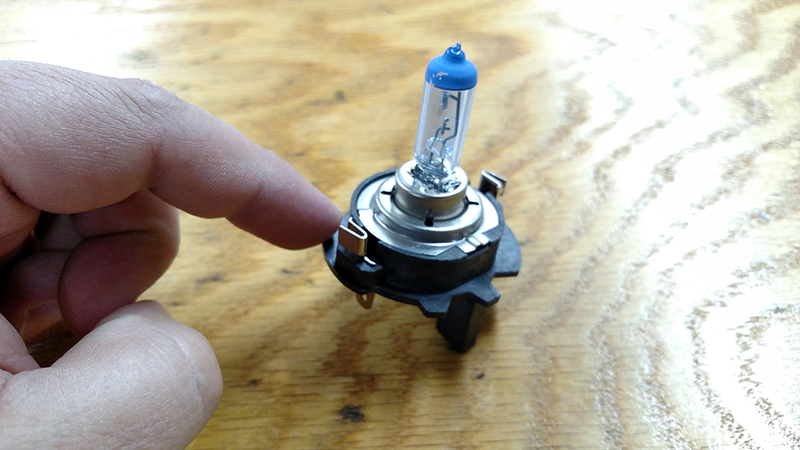 Inside each HID bulb are metal salts and Xenon gas. These gases ignite and glow when a high intensity electrical arc passes through them. This is how the light is created. So how can a single HID bulb create two beam patterns? The answer is found by moving the position of the light output inside the housing. An electromagnet changes the position of the electrical arc housed in the glass bulb further away or closer to the reflector housing of the headlight. Once the electromagnet is triggered, the bulb is pulled inward toward the housing ultimately changing the headlights focus and light output. This is why a relay harness is needed in the installation of dual beam HID headlights; the relay is what controls the electromagnet. 1. Battery Connection: This wire says “battery plus” and has a fuse built-in. The ring terminal connects directly to the positive batter terminal on the vehicle. 2. Original Headlight Wiring Connection: This connection is the same as the back of your original halogen bulb. This connection gets plugged into your original factory headlight wiring where the original headlight bulb had been. 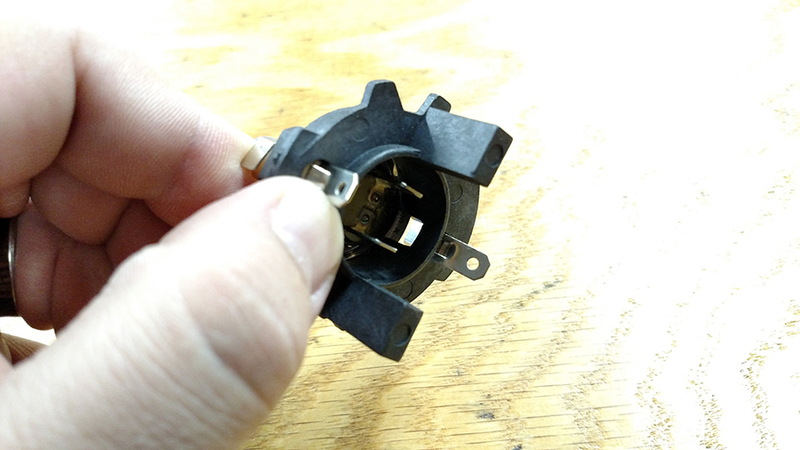 It will leave one of your headlight connectors unplugged because 2 connections here are not required. This is normal. 3. 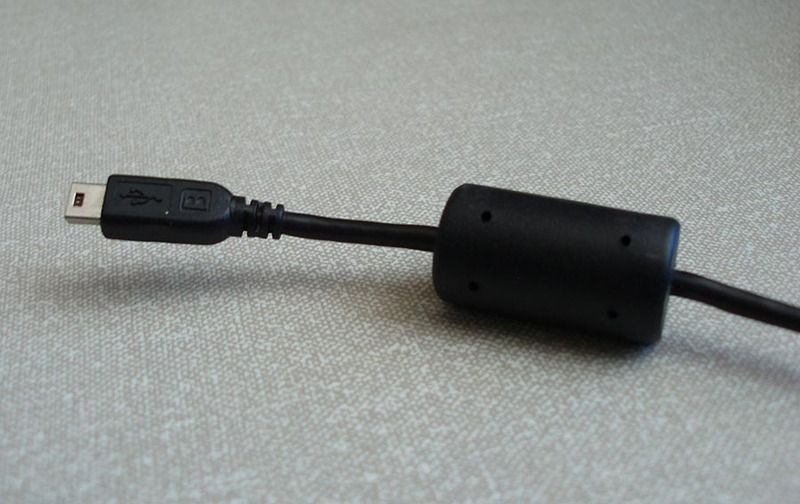 Ballast Output Connectors (2): The remaining connectors connect to the HID ballasts and bulbs directly on either side of the vehicle. 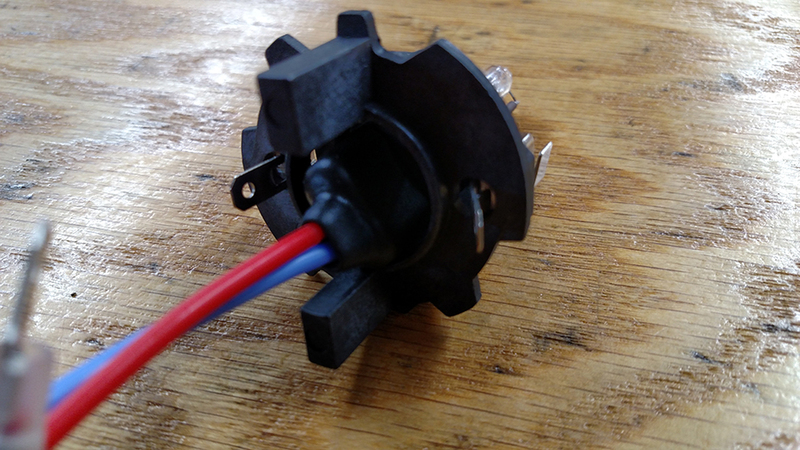 Each set of wires going to each headlight includes a ballast connection, HID bulb connection, and a grounding terminal. You’ll have to run the wiring safely through the under-hood area to each headlight housing area. To start the install, we’ll connect the harness to the battery. Next plug the main 3-pin connector of the harness into one side of the factory headlight wiring. Lastly we’ll connect the ballasts and bulbs. Start by laying out the harness above the engine bay so you get the general idea of where the connectors will go. 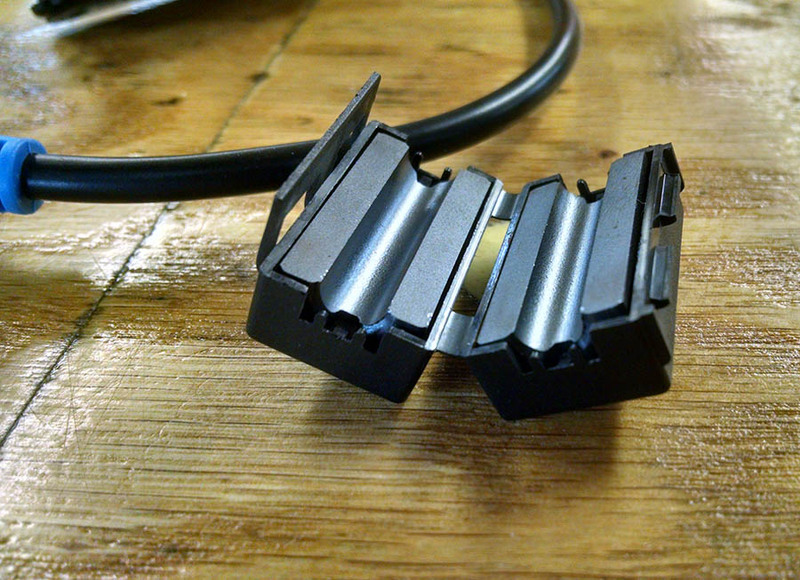 The battery connection gets connected directly to the battery terminal by loosening the battery terminal connection and adding in the ring. Next, run the headlight harness and the ballast harness down to the headlight area closest to the battery. 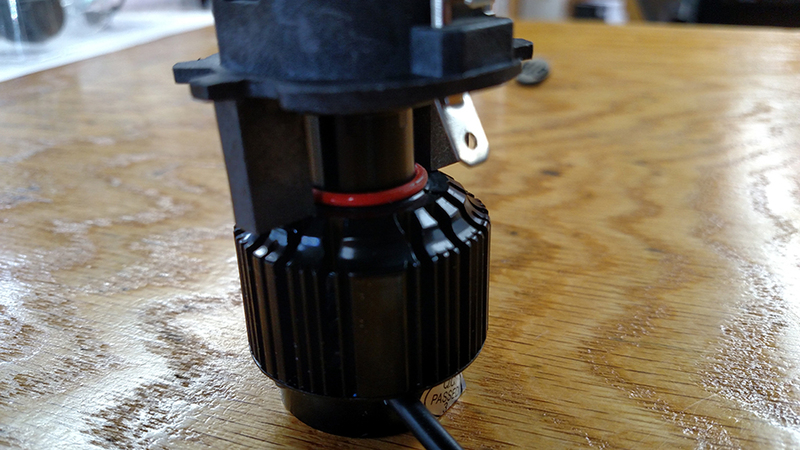 Mount the relay box vertically with the tab facing upwards—this will help keep any water from pooling inside the relay box. In this installation we simply zip-tie the box to the existing factory wiring harness near the fuse box. Now, attach the original headlight wiring connection to the relay harness connection. Next we attach the ballast in a spot that is out of the way; for this install we just zip-tie the ballast. Now connect the ballast to the relay harness and be sure to ground the ballast using the ground wire located on the relay harness. Here we found an existing screw and just added the ground wire from the relay harness to this screw. If you cannot find an existing screw, just add a self-tapping screw to the thin sheet metal in a spot that will not interfere with other wiring, cooling systems or anything else on the vehicle. Next, connect the bulbs to the harness and the ballast wires. The other headlight will be done exactly the same, except that the factory headlight bulb wiring on the opposite headlight will not be needed or connected to the harness. The second headlight factory wiring will just sit unattached to any bulb or harness. We hope you understand a little more about HID technology and about the install. Feel free to watch the video below to see the install step by step and get a hold of us if you run into any questions. What is the best D2S, D2R or D2C HID bulb to use? When looking at D2 HID bulbs, it can be tricky to determine which bulb you need. Do I need a D2S, D2C, or D2R? The difference between D2S and D2R is that D2S HID bulbs are designed to be used in a projector headlight application and D2R is made for a reflector application. D2R has a painted shield on it as to where the D2S doesn’t. The D2R HID bulbs have a painted section on the glass because otherwise there would be too much glare in a reflector housing, it acts as a type of deflector to only let the HID light shine in some directions, it also helps to reduce the amount of yellow light that is seen in the light output. 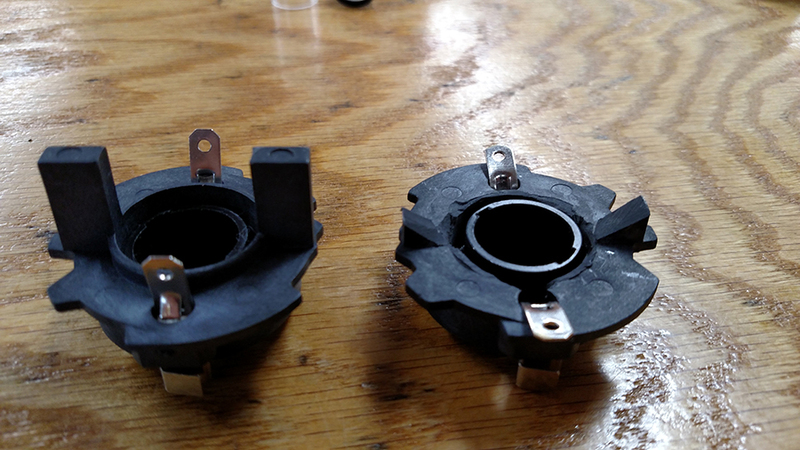 The manufacturer of these D2 series HID bulbs has certain notches cut out of the base of each bulb making it impossible to accidentally install a D2R bulb into a D2S housing, and vice versa. The keyways only accept the proper bulb. When looking at HID bulbs, one important feature to look for is how the glass is attached to the bulb. Higher quality HID bulbs have a metal structure around the base of the glass where it attaches to the base. This metal structure helps to keep the glass in place and to stay in better alignment. Any shifting of the glass bulb inside of the housing will effect the headlights beam pattern. As you can see the GTR Lighting D2C HID bulb is a direct copy of the OEM HID bulb. One major difference in the GTR Lighting bulb versus the OEM bulb is that the GTR Lighting HID bulbs come in different colors. OEM bulbs are available in only one or two colors like 4,300K (whitish yellow). GTR Lighting HID bulbs are available in colors anywhere from 3,000K (golden) to 12,000K (purple). In order to replace the headlights in the 2015 Toyota Tundra, we have to take the headlights off the truck. There isn’t much room back there to squeeze your hand in and do all the work, so we’re going to remove the grille and the trim pieces below the headlights. From there you can unbolt the actual headlights and replace the light bulbs. To remove the grille, there are two plastic clips on the top corners and they can be removed with a trim tool. There are also four 10 mm bolts that can be removed with a socket or screw driver. Once the grille is unbolted, it pulls away from the truck. Now that the grille is off, the trim panels below the headlights will also need to be removed. These pieces also have plastic clips and can be removed with the trim tool. Once the clips are removed, all that’s left holding the trim piece in place are tabs on the side of the vehicle. Pull the panel out ward away from the vehicle to detach the tabs. Now remove the three bolts from the headlight housing. Two bolts are located on the top of the headlight and one is on the side. With a towel placed on the lower bumper to avoid scratches, lift upwards on the two arms at the top of the headlight where the bolts were removed. Now we have access to everything on the back of the headlight: parking lights, blinkers, and headlight bulbs. 2015 Tundra HID conversion kit, H4 bulbs. LED Headlight Bulbs for 2014 – 2016 Tundra. On many Volkswagen and Audi cars the headlight bulbs are held in place with external clips that have the power wires built into them. This can make installing an aftermarket HID conversion kit difficult because the larger HID bulb doesn’t fit and the new HID bulbs already have wires coming out of them. This same problem exists when trying to install aftermarket LED bulbs, specifically H7 LED headlight bulbs on Volkswagen and Audi vehicles. This is what your bulb adapter probably looks like with the original halogen bulb installed. GTR Lighting has specific HID bulb adapters to solve this problem when upgrading to HID bulbs. You can find a list of all these adapters here. So could we use the same H7 adapter and make it work of H7 LED headlight bulbs? This is how the H7 HID bulbs fit. 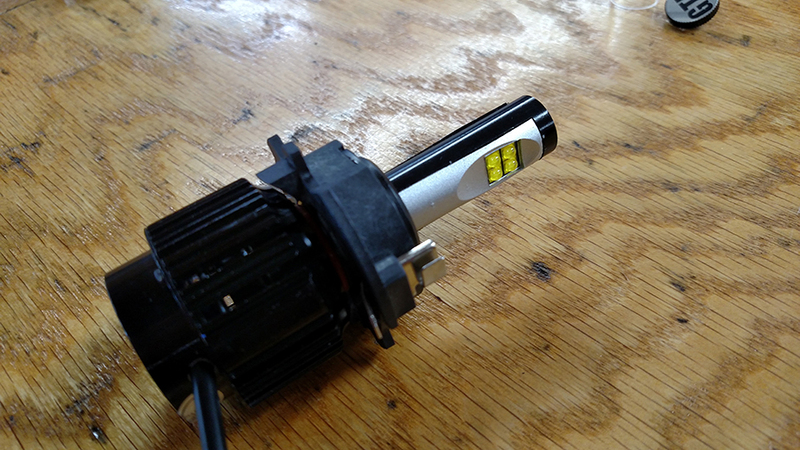 These adapters are specifically designed for HID bulbs, but can be modified to also work with GTR Lighting GEN 2 LED Headlight Bulbs. 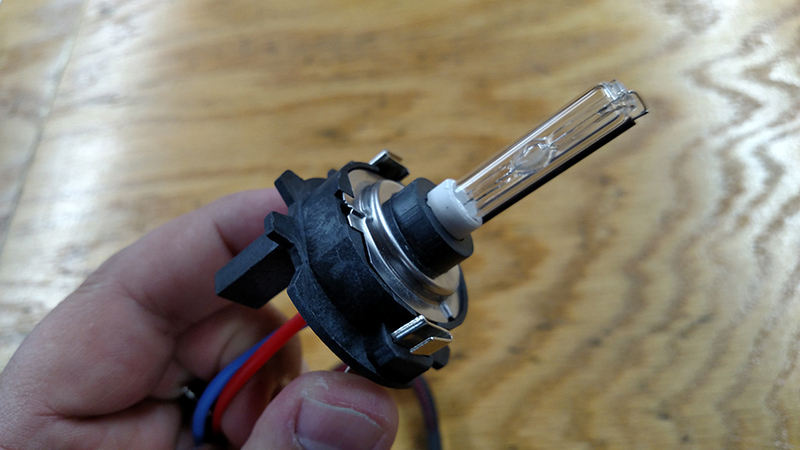 Here is what we found: The H7 HID Bulb Adapter, found here, can in fact be used to create proper H7 bulb fitment in Volkswagen and Audi vehicles that have the metal clips to hold in the bulbs. With some slight modifications, this adapter worked great. 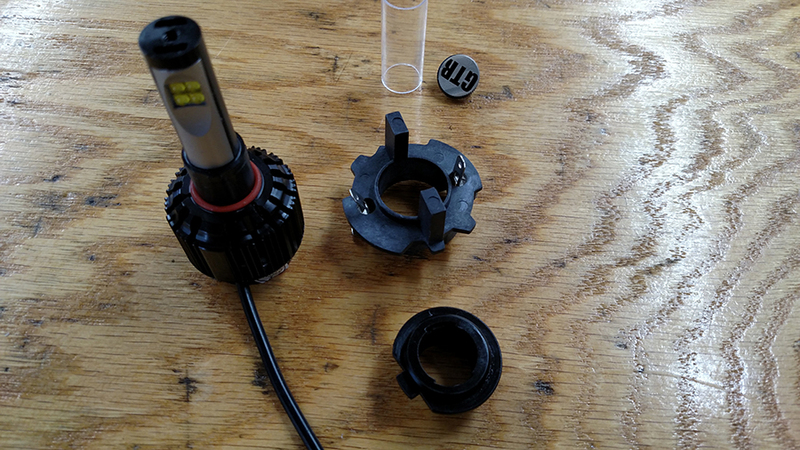 The GTR Lighting GEN 2 LED headlight bulbs come apart easily. The thumb screw on top allows the color shield to come off, then you can twist off the H7 style adapter collar. 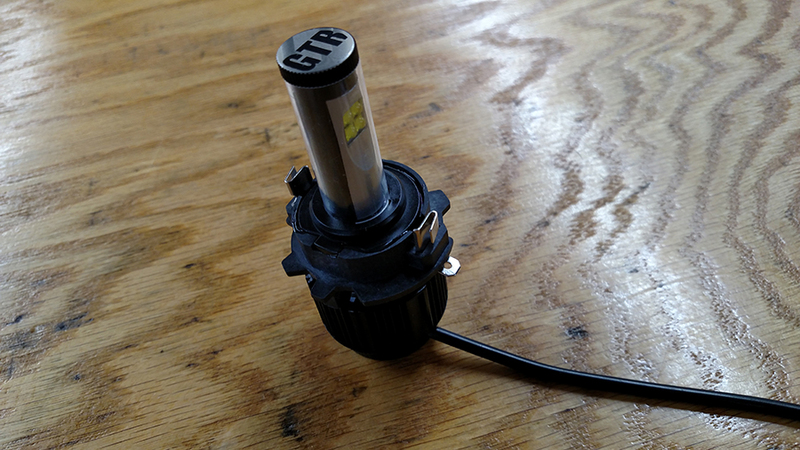 The H7 style adapter collar from the GTR Lighting GEN 2 LED headlight bulb fits in the HID bulb adapter. When you go to re-install this piece it hits the heat sink of the new LED bulb. These two tabs need to be trimmed. 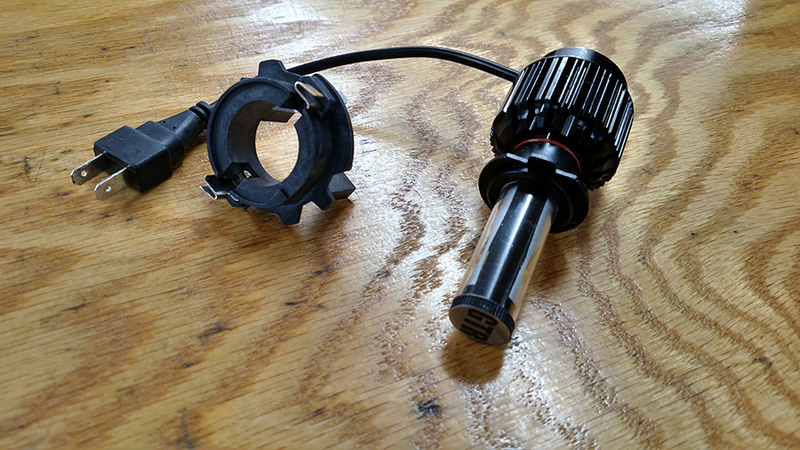 Using a bench grinder or a knife, cut down the two tabs on the bottom of the adapter so that they are much shorter and meet the angle of the heat sink on the back side of the LED headlight bulb. Here you can see the H7 style adapter collar re-installed on the bulb, with the HID bulb adapter (modified now) also installed. 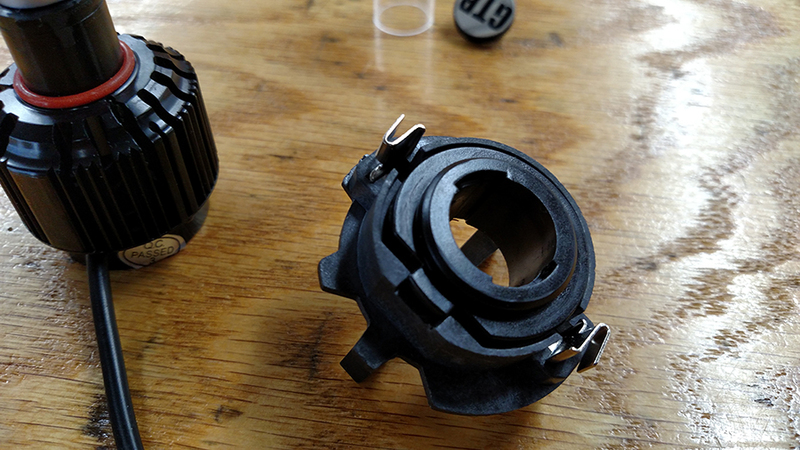 It gets sandwiched between the H7 adapter collar on the LED bulb and the heat sink. This method should allow you to install H7 LED headlight bulbs into your car when a bulb adapter is required.